When a person is shot, two things happen simultaneously – bleeding occurs and blood pressure plunges. Depending on what internal organs, nerves or blood vessels were hit, the victim might die on the spot of excessive blood loss, pass out as organs fail or survive the trauma but die of infection later. Given this, the task of trauma specialists treating victims of gunshot wounds in emergency rooms around the world is clear: Stop the bleeding, either by suturing any blood vessels that were hit or closing the wound. After that, they must raise and stabilize the victim’s blood pressure. Only then can the trauma staff work to prevent infection of the bullet wound and preserve nerve tissue. Here’s a close look at the many variables involved when someone is shot and how trauma specialists respond. 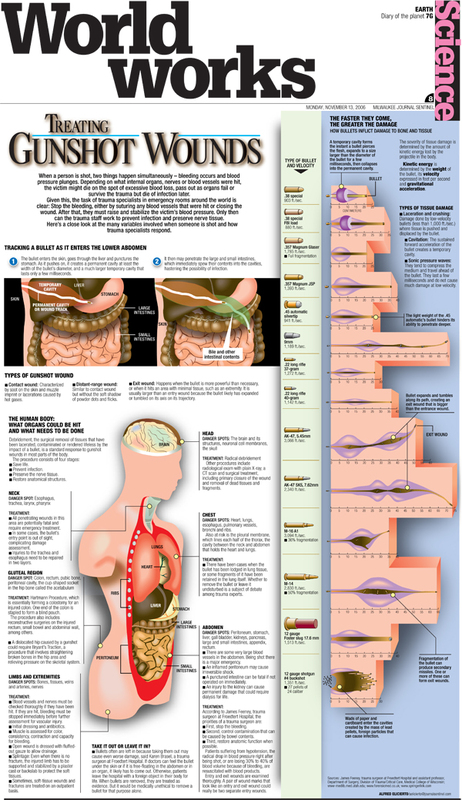 For a detailed look at this full-page graphic, click here for a PDF. Graphic by Alfred Elicierto. Published in the Milwaukee Journal Sentinel on Nov. 13, 2006. Producing this graphic required plenty of research not only for factual material but also visual references. On top of this, I visited the trauma section of the Froedtert Hospital in Milwaukee and sat down for a few sessions with Dr. James Feeney, trauma surgeon and assistant professor in the Department of Surgery, Division of Trauma/Critical Care at the Medical College of Wisconsin. The idea about tracking the bullet as it enters the lower abdomen, and the possible onset of sepsis, came from the movie war movie Three Kings. You have mentioned very interesting points. P.S. Decent Web site.